Many moons have passed since my last MoonaLisa order. Two things aligned to spark this haul: I was out of bath goodies and the Sihaya and Company box with the 4 in 1 from MoonaLisa rekindled my appreciation. For a second I had thought MoonaLisa was going to close up shop but it turned out she shifted the business model to where she makes the perfumes and Paul makes the bath and body. Once the Winter collection was released I headed on over to restock my bath cupboard. Of course the 4 in 1 Fine Bubble Wash had to come home to me. In a few scents. Winter Solstice- Winter 2018 version. 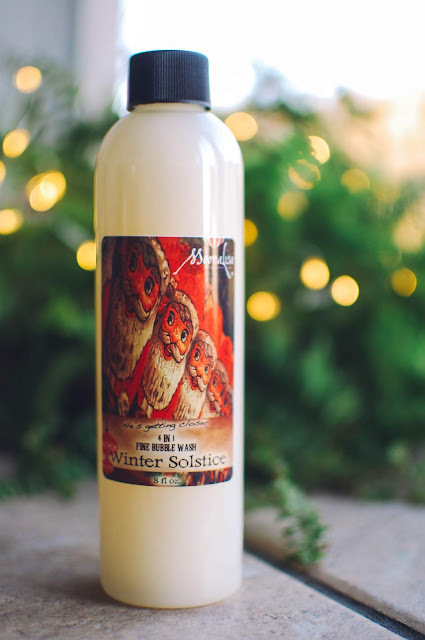 Tune into quiet winter mysteries with a blend of different sacred resins, such as frankincense and myrrh, nutmeg and labdanum absolute. $11.95 for 8 ounces. These 4 in 1 washes really shine as a bubble bath for me. I have washed my body with them with success but I prefer bar soaps to liquid soaps, so bubble baths they remain. 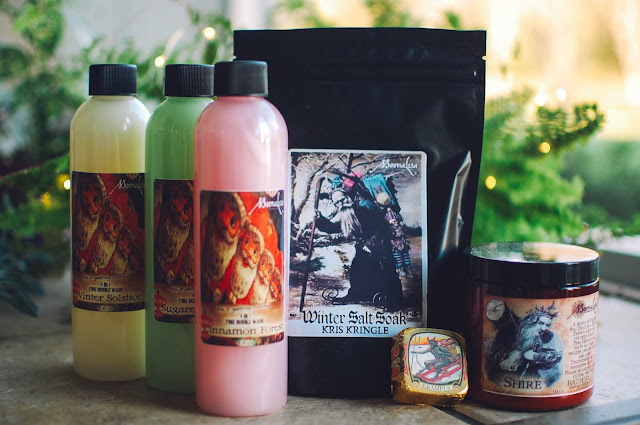 They can also be used for shampoo and fabric wash. Winter Solstice smells amazing. The resins really shine and offer refined comfort. Sugared Forest- Sugared spruce, frosted berries and fir trees. 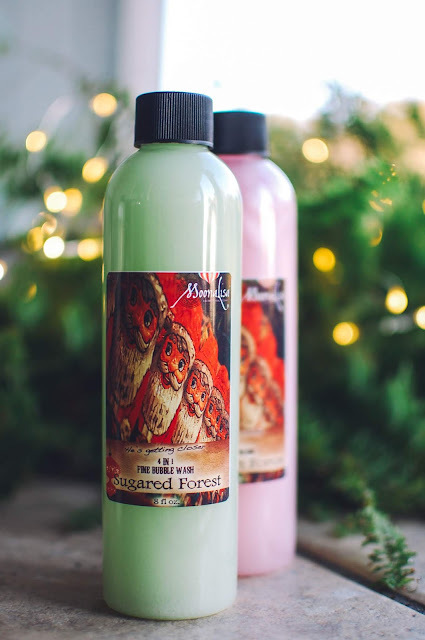 Sugared Forest smells deliciously like chewy almond marzipan and sugar crystal coated fir needles. The fruits don't really emerge for me but I quite like it just how it is. It makes for a beautiful winter scent and not exclusively a Christmas scent. Cinnamon Forest- Piping hot mulled cinnamon drink with vanilla beans and cedarwood. Candied Red Hots made dusky with tonka and dark woods. I really love how the sweet spice is tempered with the velvety vanilla shadows and cedarwood. 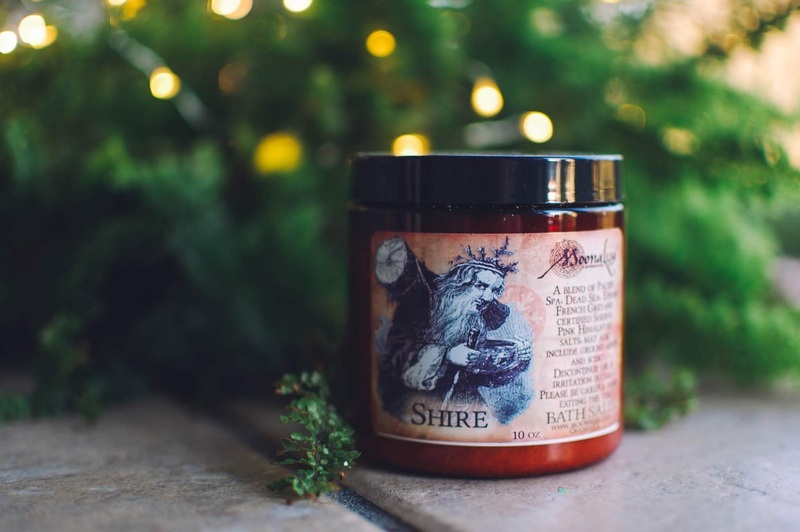 It is a divine scent I will use up quickly. 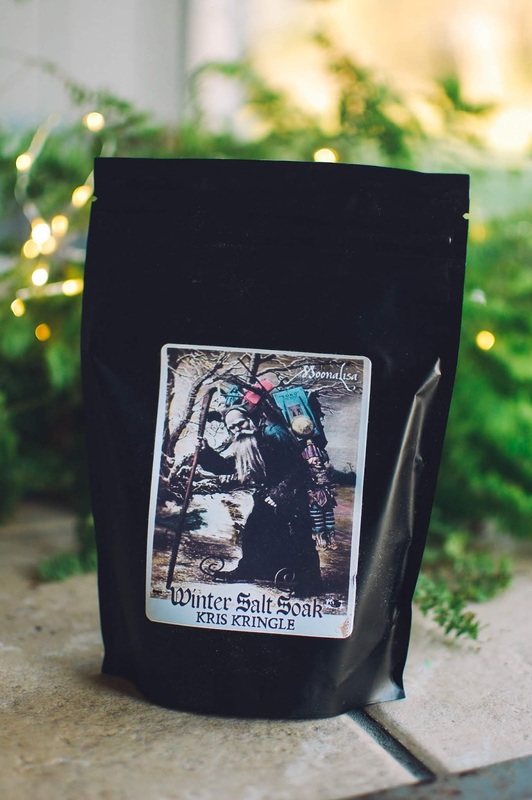 Kris Kringle Winter Salt Soak- Blend of various woodland accords, Yuletide spices, vetiver and Douglas fir essential oil. $10.95 for 12 ounces. This Winter Salt Soak lent a calming experience to my bathing ritual. The salt soak wafted up with a billowy fragrance and the citric acid offered a gentle foam and imparted a milky water. It left my skin soft and silken. The scent evokes Christmas trees and gingerbread snaps and a touch of earthiness from the mud coated boots from friends and family hastily left by the front door. 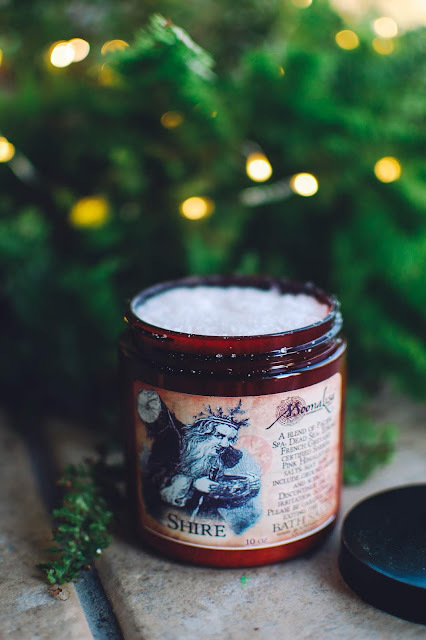 I adore not only the scent of these salts but the label art too (and of course the subject matter). This must be what Bilbo's garden was redolent of that fateful morning he smoked his pipe when Gandalf came upon him asking about an adventure. A base of sweet soil and dewy plantlings, cool minerals and a breath of pine all swirl around a Shire breeze that lifts those smoke rings high up in the clouds. Brilliant. 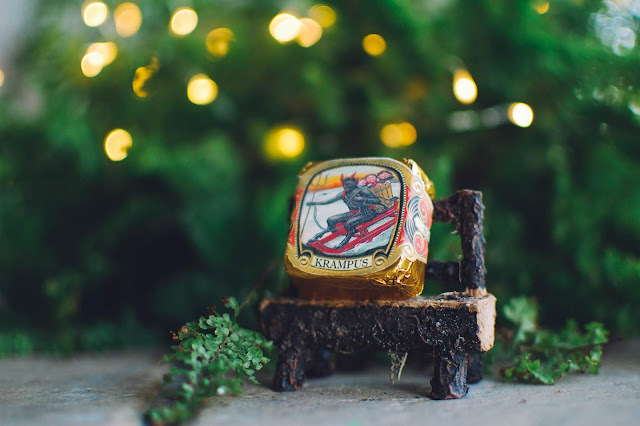 This wee Krampus guy in a small foil pouch must be something good but I am so enamored of the wrapping I am hesitant to open it. I am guessing it is either a chunk of soap or a bar lotion. I guess I will find out eventually. I am thrilled with these bath goodies. They will get used fairly quickly as I take a bubble bath about 4.5 times a week. Did you order from the latest Moona update? What are you using in your bath tub or shower? 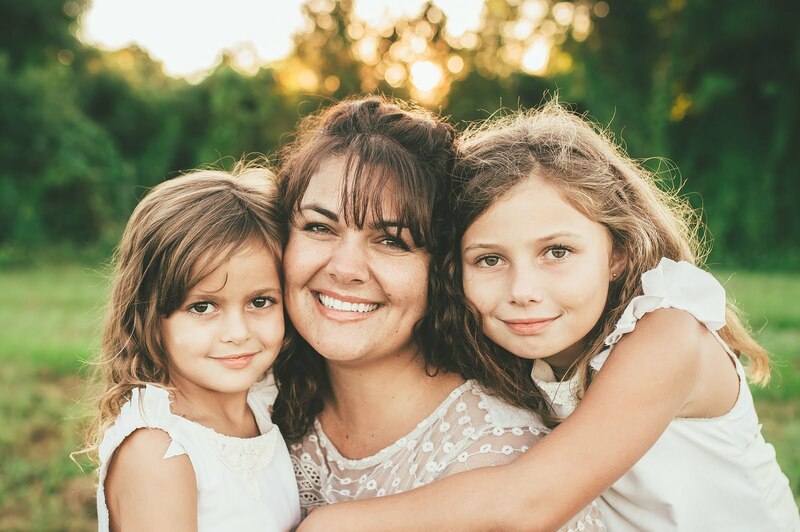 I've purchased a handful of Moonalisa perfume oils for myself in the past year and bought a cocoa butter lotion for my mother. Otherwise, I haven't explored other bath and body products. The bath soaks tempted me. And I really want those pillar candles. Bath soaks/salts/milks/teas always reel me in. Cocoa butter lotion sounds divine. Those candles are pretty awesome looking. I did like the Moona candle I picked up in the past but the throw was not really all that strong. It was nice though. The pillars would be cool simply to have as ambiance.